Peter Lamprey writes to his work mates complaining about life and hoping to get leave to visit them. He also mentions that some personnel have left for the next stage of training and he might be soon to follow. From the lack of real news that is contained in your letters I should imagine all you perishers are on holiday. I thank all the kind friends who wish me well, but seeing that I am about the only one who seems to be doing anything, I suppose they hope I keep healthy and keep on doing their share. However having found a few good companions, I am proceeding to rack and ruin with all possible haste and bags of help. and strength to stand it, I could kill myself with dissipation in very short order. Not having the iron frame for it I am content to die in the usual period. From the slight information to hand I gather the three stooges are still cluttering up the machine room. Just another bunch of herbs who draw their numbers a year before they join up. You still don’t say what they are going to be – except sorry they joined. As for having a nice time in the open air – they’ll be getting a bit of open air work about 6 30 every morning – very nice to. [sic] I hope it chokes them. worth while writing and pouring my heart out to you as I only seem to collect loads of dirty cracks in return. And if I ask for anything – like that bloody photo Bert Smith is hanging on to – I get treated with just the right amount of indifference. Still I shall be along again shortly and collect what is coming to me and so will some of you. Although I don’t suppose it will interest anybody in particular but just as a matter of form, I might mention that I have put in for a spot of leave on Sept. 5th. If anybody is away on holiday at the time there is no real need to call them back and let me have a look at them. I can still remember how all of you look. If you think I am going to waste one of my valuable evenings in the Harrow Tavern this time – you are right for once. The news from here is still the same. Still easing the war over the bumps and making sure it doesn’t fold up altogether. They have left us alone for a week or so and we are nicely in the groove again and going well. One of these days someone will proceed to clump me over the skull with a lump of rock or something and the war will take a definite turn for the worse. Quite a number of the boys have left for the rest of their course and I should never be surprised (sort that blasted word out yourself) if they don’t whip me out of this haven of rest and bung me south to get on with the war from a back seat. It won’t happen this week as I’ve got no big dates but just as soon as I do manage to fiddle something really lush I can see the shoulder easing me out. I am glad to have the news that the old RIP has settled down at last and is giving the youngsters a chance to get in on the game. The competition is fierce enough without having to compete with blokes like him who should by rights [deleted] indecipherable word [/deleted] be gardening instead of gadding around. One of these days they will catch up with him and the News of the World will go to 48 pages. It is a good job he has always been used to taking his food out of a glass as it will save a lot of wear and tear on his new furniture. He only needs a new set of artekies [sic] now and he could start his larks all over again. Thanks for the P.O. and may your legs never fester. I should keep away from Horsenden Hill for a while and try and act more like a gentleman with two ladies who wrote to me about your doings in Lyons. Hope to see you in a fortnight or so. Remember me to all. P.S. I hope Eddie Hunt had a decent funeral. 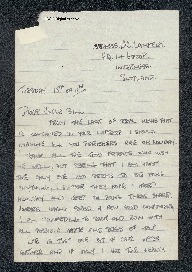 Peter Lamprey, “Letter from Peter Lamprey to W Gunton,” IBCC Digital Archive, accessed April 21, 2019, https://ibccdigitalarchive.lincoln.ac.uk/omeka/collections/document/6640.